CVXPY is a Python-embedded modeling language for convex optimization problems. It automatically transforms the problem into standard form, calls a solver, and unpacks the results. # Create two scalar optimization variables. # Form and solve problem. prob.solve()  # Returns the optimal value. The status, which was assigned a value “optimal” by the solve method, tells us the problem was solved successfully. The optimal value (basically 1 here) is the minimum value of the objective over all choices of variables that satisfy the constraints. The last thing printed gives values of x and y (basically 1 and 0 respectively) that achieve the optimal objective. prob.solve() returns the optimal value and updates prob.status, prob.value, and the value field of all the variables in the problem. Problems are immutable, meaning they cannot be changed after they are created. To change the objective or constraints, create a new problem. If a problem is infeasible or unbounded, the status field will be set to “infeasible” or “unbounded”, respectively. The value fields of the problem variables are not updated. Notice that for a minimization problem the optimal value is inf if infeasible and -inf if unbounded. For maximization problems the opposite is true. The problem variables are updated as usual for the type of solution found (i.e., optimal, unbounded, or infeasible). If the solver completely fails to solve the problem, CVXPY throws a SolverError exception. If this happens you should try using other solvers. See the discussion of Choosing a solver for details. Variables can be scalars, vectors, or matrices, meaning they are 0, 1, or 2 dimensional. # Vector variable with shape (5,). # Matrix variable with shape (5, 1). # Matrix variable with shape (4, 7). You can use your numeric library of choice to construct matrix and vector constants. For instance, if x is a CVXPY Variable in the expression A*x + b, A and b could be Numpy ndarrays, SciPy sparse matrices, etc. A and b could even be different types. # Solves a bounded least-squares problem. print(x.value) # A numpy ndarray. As shown in the example code, you can use ==, <=, and >= to construct constraints in CVXPY. Equality and inequality constraints are elementwise, whether they involve scalars, vectors, or matrices. For example, together the constraints 0 <= x and x <= 1 mean that every entry of x is between 0 and 1. If you want matrix inequalities that represent semi-definite cone constraints, see Semidefinite matrices. The section explains how to express a semi-definite cone inequality. You cannot construct inequalities with < and >. Strict inequalities don’t make sense in a real world setting. Also, you cannot chain constraints together, e.g., 0 <= x <= 1 or x == y == 2. The Python interpreter treats chained constraints in such a way that CVXPY cannot capture them. CVXPY will raise an exception if you write a chained constraint. Parameters are symbolic representations of constants. The purpose of parameters is to change the value of a constant in a problem without reconstructing the entire problem. Parameters can be vectors or matrices, just like variables. When you create a parameter you have the option of specifying attributes such as the sign of the parameter’s entries, whether the parameter is symmetric, etc. These attributes are used in Disciplined Convex Programming and are unknown unless specified. Parameters can be assigned a constant value any time after they are created. The constant value must have the same dimensions and attributes as those specified when the parameter was created. # Column vector parameter with unknown sign (by default). # Matrix parameter with negative entries. # Assigns a constant value to G.
Computing trade-off curves is a common use of parameters. The example below computes a trade-off curve for a LASSO problem. # gamma must be nonnegative due to DCP rules. # an expression in the problem. 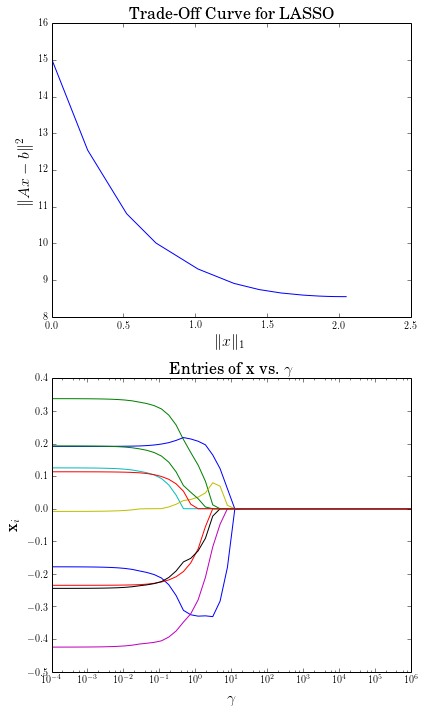 # Plot entries of x vs. gamma. Trade-off curves can easily be computed in parallel. The code below computes in parallel the optimal x for each \(\gamma\) in the LASSO problem above.